Wi-Fi is the easiest way to create a network and get broadband anywhere in your home. In this guide we’ll explain how to set up and use WiFi broadband using your wireless home broadband router. You'll also find tips for securing Wi-Fi, improving poor wireless signal and troubleshooting common problems. To use wireless broadband at home you will need a wireless router. This should be supplied by your ISP, and it's usually free. It is often possible to use your own router if that’s preferable, but check with the ISP first. The wireless router will include a power adapter, cable for the broadband/phone socket, at least one ethernet cable and - depending on the type of broadband - a microfilter or two. In some cases the provider may supply a separate modem and wireless router. This type of setup differs only slightly and is not complicated to install, but you will need an additional power socket. A surge protected power strip is an optional but recommended extra. These are not expensive, and will protect your electronics in case of a power surge. Microfilters reduce interference between the broadband service and voice calls. They must be installed on all telephone sockets in use around the home, unless you have the newer dual-socket phone points (these have built-in filters). Your ISP should include microfilters with the router. Microfilters are most commonly used for ADSL broadband. They will only be required for fibre optic broadband if you do not have the dual-socket faceplate on your telephone line - but if an engineer is required to set up the fibre broadband they will fit these for you. Microfilters are not required for Virgin Media broadband. Connect the router to the power and the broadband or telephone wall socket using the supplied cables. You can also connect any wired network devices to the LAN ports on the back of the router. If you have a separate modem and router, the modem is connected to the wall socket then linked to the router with a network cable. 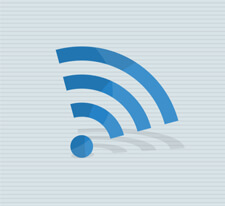 To connect wireless devices such as smartphones, tablets and games consoles you’ll need the Wi-Fi SSID (the network name) and password. For now, use the default settings which are provided in the manual or displayed on a sticker on the router itself. On a Wi-Fi device select the SSID from the list of networks (in a busy area there could be lots of these) then enter the password when prompted. Because wireless networks can be accessed from outside your home it's very important to keep a Wi-Fi network secure by following these tips. Change the default admin password. Out of the box your Wi-Fi router’s settings are likely to be protected with only a weak default password. If someone gets access they could cause all sorts of havoc, so the first thing you should do is change this to a strong and unique password. Change the Wi-Fi password. The default Wi-Fi password is probably reasonably secure as most now come set up with a random unique phrase. However it’s also likely to be displayed on the router itself, which isn’t very helpful if you’d like to control who can use the Wi-Fi. Access your router settings and change this. Change the Wi-Fi SSID. The default network name (or SSID) is likely to show either the make and model of the router, or the name of your ISP. This can help an attacker, as they’ll be able to apply known security vulnerabilities or default passwords to gain access. Choosing your own network name makes things a little more difficult (and helps to pick out your network if there’s lots of other Wi-Fi signals nearby). Keep the router updated. Check for firmware updates to your router on a regular basis to protect against new security holes. Use WPA2 security. Check that your router is using the ‘WPA2’ security standard, not WPA or WEP (this will probably be shown in the same section of the settings where you change the Wi-Fi password). WPA2 is a far more secure standard than the older WPA or WEP, which can both be easily cracked. Disable WPS. Wi-Fi Protected Setup (WPS) makes it easy to connect new devices without having to select the network or enter a password. But this convenience comes with a security flaw that can make it easy for hackers to break your Wi-Fi password. We recommend disabling it. For further help read our guide to securing home and business broadband routers. Wi-Fi is wonderful when it works but the signal is relatively short range, and can be blocked by walls or affected by interference from household appliances and other networks. It’s possible to get fast Wi-Fi access all over your home, including the garden, but to do so you’ll need to ensure your network is operating efficiently and perhaps invest in some extra hardware. To get the most out of your Wi-Fi the router should be installed in a central position in the home, away from walls and sources of interference such as kitchen appliances and cordless telephones. Wi-Fi networks operate on various channels within their frequency band, and if there are lots of other wireless networks in the area sharing the same channel it can affect performance. Manually select a quieter channel to avoid interference. To find the best channel use a smartphone network tool such as Wi-Fi Analyzer. Wi-Fi boosters (also known as range extenders and repeaters) are a cheap way to expand the network beyond the router’s maximum range. Wi-Fi boosters take the weak signal and re-broadcast it. You do lose some performance, but they can greatly increase coverage. Another option is a powerline network booster, which use your home’s electrical circuits to transmit data between an adapter connected to the router and a booster anywhere else on the same electrical circuit. The advantage of these is that they can be used even in areas where there is no Wi-Fi signal to boost. Both are relatively cheap, with basic Wi-Fi boosters starting from under £20. Weak signal strength. The weaker your wireless signal, the slower and less reliable the internet. If you can, move closer to the router. If that’s not possible or it’s a recurring issue you may need to invest in Wi-Fi boosters (see above). Busy shared networks. Slow speeds can be caused by other people or devices using the internet at the same time. Shut down unnecessary software and hardware to reduce the load on your broadband bandwidth. You should also check that the Wi-Fi isn’t being used by neighbours or anyone else who shouldn’t be there. Check the router’s admin controls to view connected devices, and if necessary change your Wi-Fi password. Signal interference. Change your Wi-Fi channel to one that’s not used by other networks nearby to reduce interference and improve your Wi-Fi performance. No broadband? Sometimes your internet access will just stop working. This is common and there’s not always an obvious reason. Usually the easiest fix is to simply power cycle the router. Switch it off and on, then wait a few minutes for it to reconnect. If this doesn’t fix it, contact the ISP to find out if there’s a network outage and get help from tech support. No Wi-Fi? If the Wi-Fi drops out then switching it off and on is usually the most effective solution (if you're using a Wi-Fi booster always try resetting this first as it's quicker and less disruptive than power cycling the router). If this doesn’t work you’ll need to connect to the router with a network cable and access the router settings to diagnose the problem. If you're after more tips, you can check out our detailed guide on how to speed up your broadband.